WASHINGTON – With U.S. student debt estimated at $1 trillion, college activists here lobbied Congress for relief last month during the United States Student Association’s annual legislative conference (LegCon). More than 300 students gathered for the three-day event packed with workshops, trainings and visits to congressional representatives. The students represented a diverse cross-section of race, class, LGBTQ, and gender identities. Frustrated by the enormity of the debt problem, USSA leaders took the matter into their own hands, helping to write the Student Loan Fairness Act. This bill ties student income with debt repayment and forgiveness after a decade of payment. A student who pays 10 percent of their income for 10 years toward their student debt would subsequently have their remaining debt forgiven. The act also includes broader debt forgiveness for students who provide medical or public services in underserved communities. It would also freeze interest rates for up to three years, if the graduated student were unemployed. USSA is working to get the bill introduced in the Senate. In 2005, private student loan corporations got away with winning federal policies that make it nearly impossible for someone who is facing bankruptcy to discharge their student debt. This is not the case for credit card debt or even debt accumulated through gambling. The USSA pressed legislators to co-sponsor the Fairness for Struggling Students Act (SB 114) and the Private Student Loan Bankruptcy Fairness Act (HR 532), which have both been introduced to address this exact issue. Student activists strategized around other critical issues including economic access to higher education, comprehensive immigration reform and an increase to the federal minimum wage. Starting with new restrictions on Pell Grants and sequester cuts to a campus-based support program called TRIO, students shared their personal stories with Congressional representatives detailing how TRIO and Pell Grants allowed them achieve their dreams of a college education. While Pell Grants have received additional overall funding from the federal government over the last four years, they have become automatically available now only to students whose families earn $23,000 per year or less. Before the automatic qualifying maximum family income was $32,000. The length of time that a student can receive Pell Grants was cut from 18 semesters to 12 semesters. USSA is pushing Congress to repeal the new restrictions on Pell Grant eligibility, and to prioritize Pell Grant funding in the federal budget for next year and years to come. TRIO is a collection of programs, including Upward Bound, Talent Search, and others, which aims to increase the representation of first-generation, disabled and low-income students in higher education. TRIO programs have suffered $54 million in cuts over the past four years, and the sequester enacted an additional $42 million in cuts to TRIO. 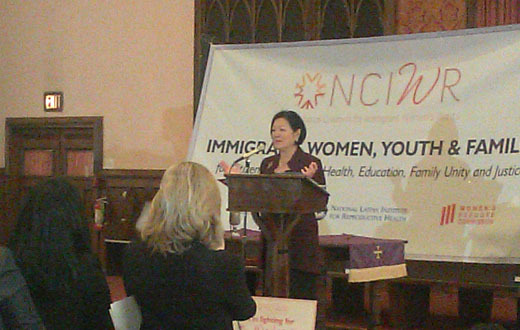 In a church filled with over 500 people, USSA activists joined with immigrant and women’s rights organizations and elected officials, including Sen. Mazie Hirono, D.-Hawaii, and Rep. Lucille Roybal Allard, D-Calif., speaking out for the rights for and visibility of immigrant women. Tiffany Dena Loftin, president of USSA, included in her powerful speech a special point on the alliance between African Americans and undocumented immigrants. “As a Black woman, I’m not exactly sure where my ancestors came from, but I know they were not from here,” Loftin said. Rights for the LGBT community, as a priority within the immigrant rights struggle, were also emphasized in nearly every speech at the rally. USSA, partnering with United We Dream, a national coalition of youth-led immigrant rights organizations, has been active in lobbying for and educating its members on comprehensive immigration reform with a path to citizenship and access to public services for all immigrants, especially access to higher education, such as in state tuition. There was a spirit of power and hope amongst the lively, young crowd that real immigration reform can be won this year. Another special feature of LegCon was SLAP, Student Labor Action Project, which is part of USSA. SLAP focuses on supporting workers’ rights and union organizing on campuses. SLAP and the students themselves have a vested interest in supporting the Fair Minimum Wage act of 2013, which would raise the federal minimum wage to $10.10 over the next two years. USSA represents over 4 million students on over 400 campuses. During the 2012 election cycle, in spite of voter suppression laws that targeted students in at least 11 states, USSA registered over 135,000 students to vote. LegCon participants indicated their seriousness towards achieving their goals for economic, racial and gender equality in the country. Many of them prepared with their local caucuses until the wee hours of the morning, operating on few hours of sleep throughout the weekend. To be amongst these dedicated, inspiring students gives one the sense that they are some of the main young activists helping bend the arc of history towards justice, through hard work and leadership development. Correction:Previously we reported the incorrect number of students USSA registered to vote. The correct number is more than 135,000.